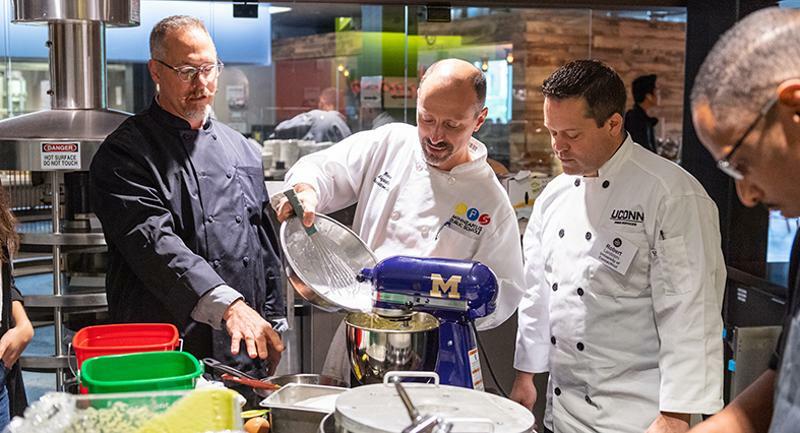 When FoodService Director’s second annual Culinary Council Summit wrapped up at the University of Michigan in early October, the chefs in attendance left with dozens of new menu ideas, hands-on learning experiences and valuable industry connections. Thank you to Michigan Dining for hosting, to the Summit’s three sponsors—Avocados from Mexico, Hormel Foods and The Mushroom Council—for their support and educational guidance, and to the 12 noncommercial chefs who took time out of their busy schedules to attend. Here are some highlights from the three-day Summit. 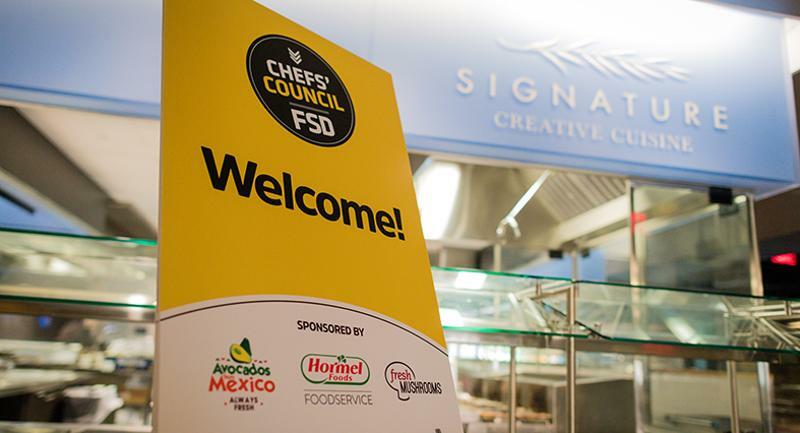 University of Michigan hosted the FSD Culinary Council Summit in its state-of-the art South Quad Dining Hall. Here is where the presentations, ideation sessions and team cooking events took place. 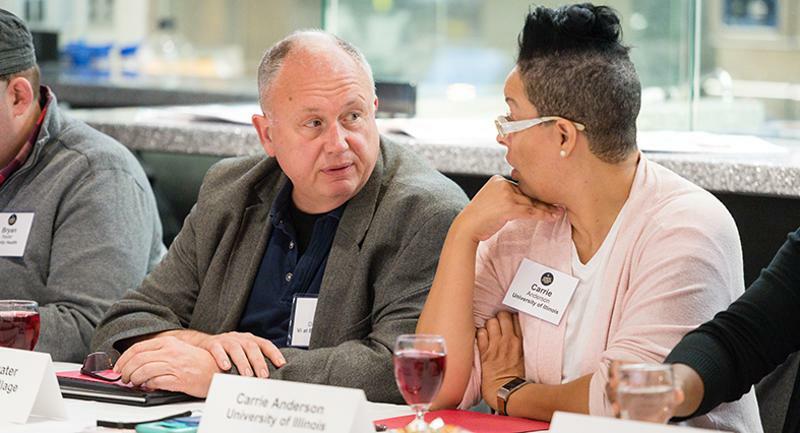 Shep Drinkwater (left), executive chef of Vi at Bentley Village, confers with Carrie Anderson, executive chef for residential dining at University of Illinois after viewing the presentations. 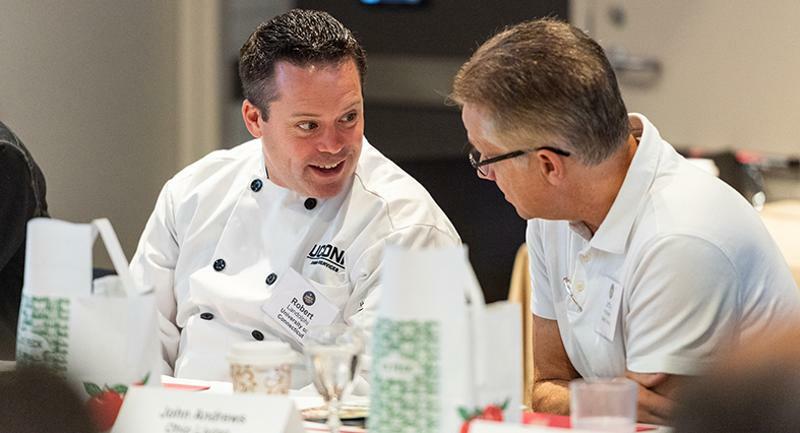 Robert Landolphi, assistant director of culinary development at University of Connecticut, shares recipe ideas with another attendee. 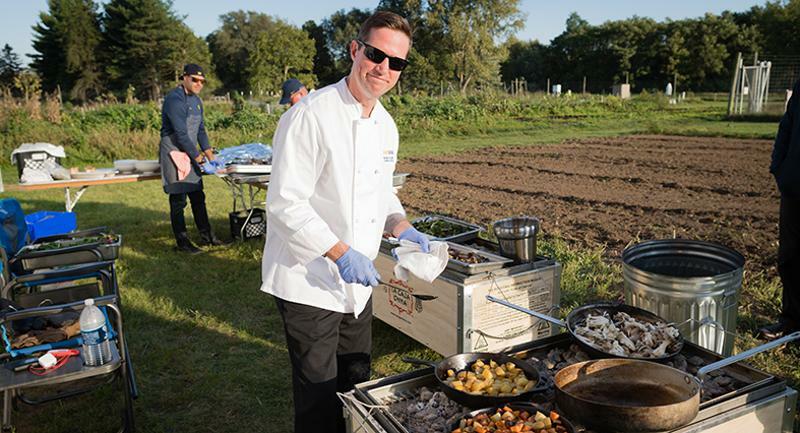 Michigan Dining chef Russel Palmer prepared vegetables harvested from the Campus Farm for the opening night dinner. Beneath the vegetables, a pig is roasting in the China box. 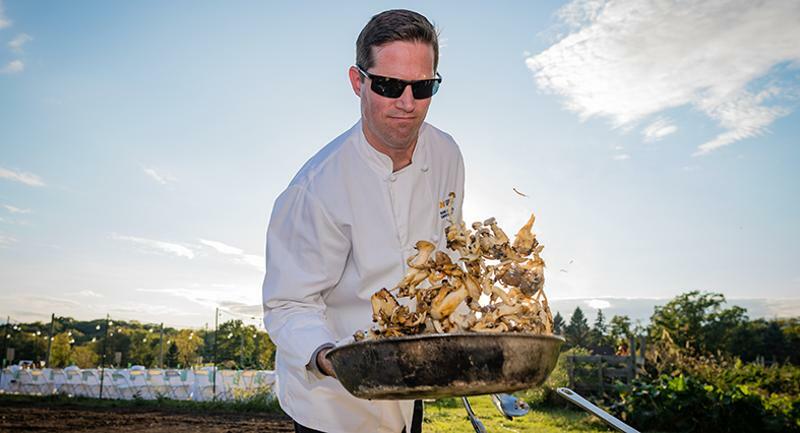 Chef Palmer shows off his toss-and-saute technique while prepping for the farm-to-table dinner. 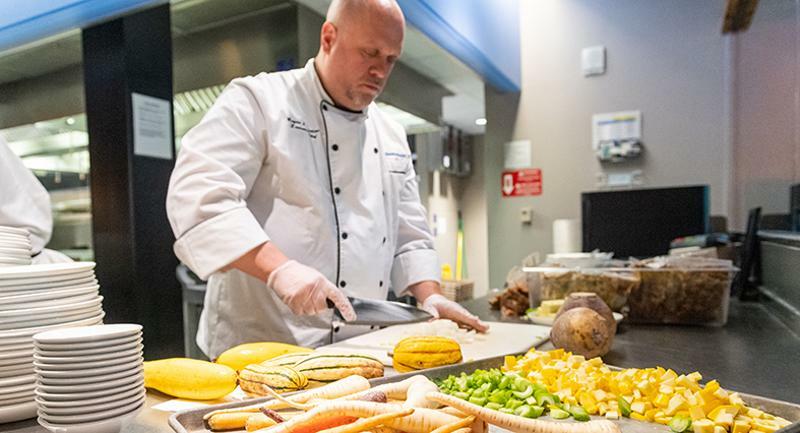 Michigan Dining executive chef Frank Turchan serves a leafy green vegetable combo harvested from the Campus Farm hoop houses directly behind the dining table. 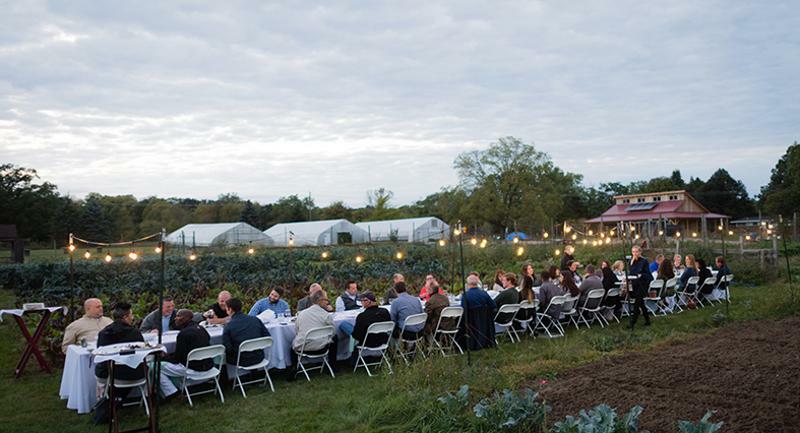 University of Michigan students joined the chefs and other Summit attendees for the multi-course farm dinner. As a rustic apple tart was served for dessert, the table was lit by dozens of twinkling bulbs. The next day, attendees put on their chef coats and got working. 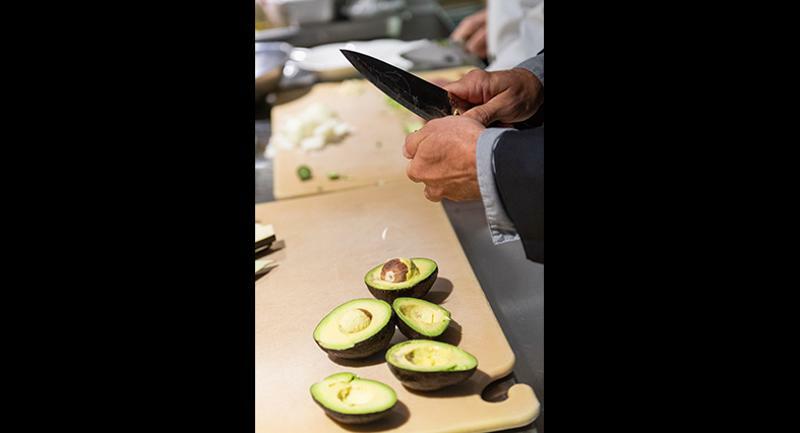 At one kitchen station, the chefs learned the easiest and quickest way to remove the pit from a fresh avocado. After ideating with their teams, the chefs collaborated to create several recipes with each of the sponsors’ products. 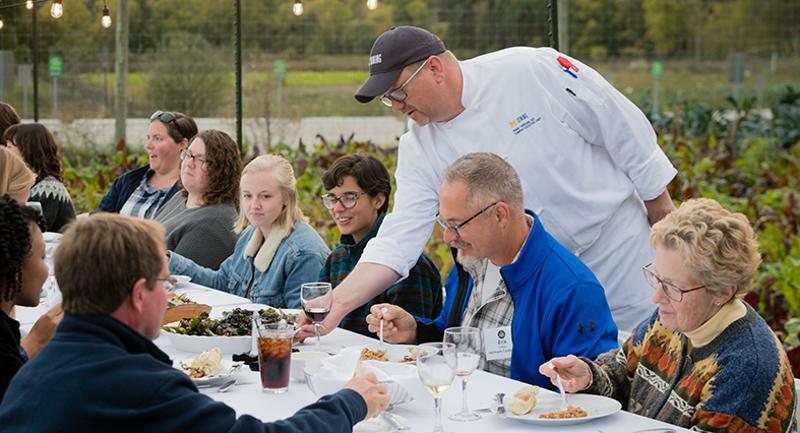 In addition to the sponsored products, the chefs selected ingredients from a market basket of fresh, seasonal produce to round out their recipes. 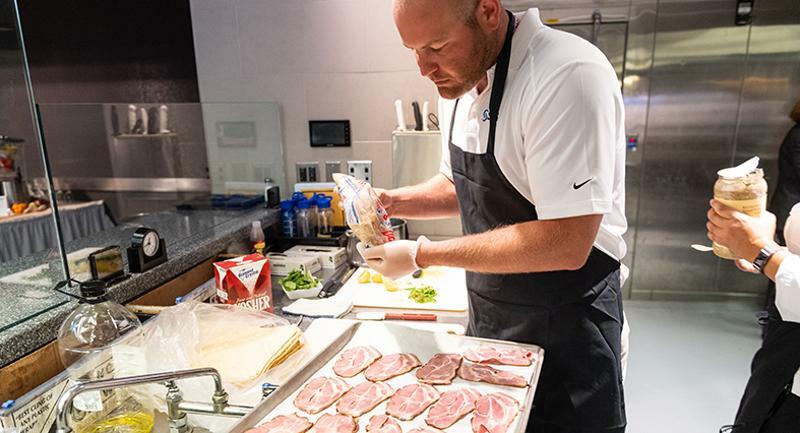 Hormel chef Tony Finnestad demonstrated a batch cooking method for preparing the company’s new shoulder bacon. Executive chef Carrie Anderson topped a flatbread with the cooked shoulder bacon. 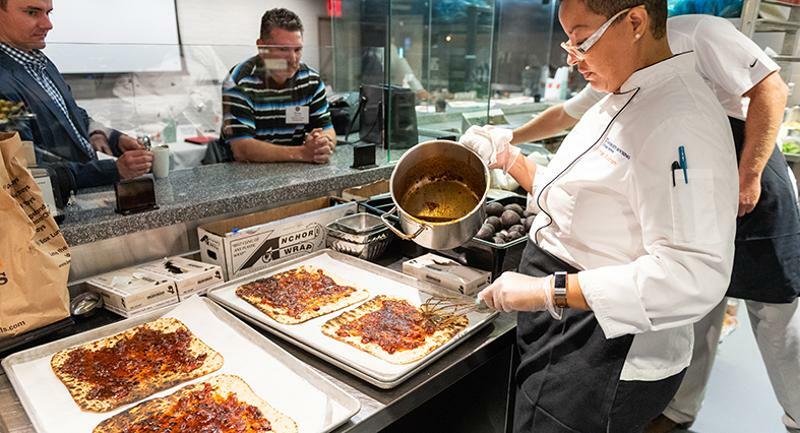 The baked flatbread was cut into squares and set out for University of Michigan students to sample during their meal service. The final night’s dinner was held at Maizie’s Kitchen & Market, a new venue in the historic Michigan League building. The space was designed to host private dinners and events for both on- and off-campus guests. 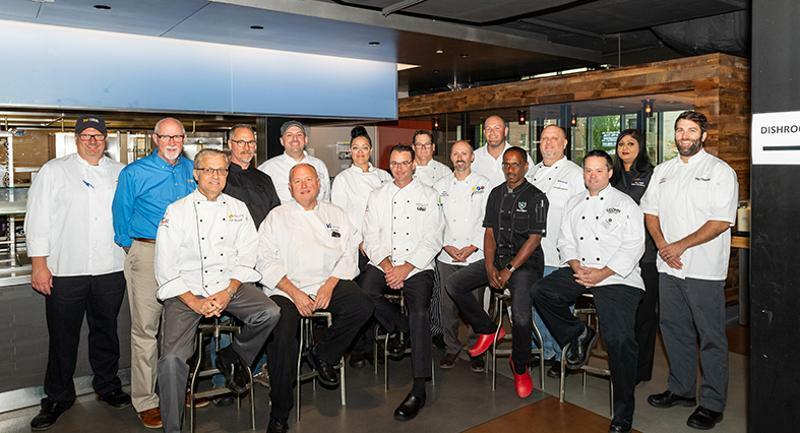 The FSD Culinary Council, sponsors’ chefs and Michigan Dining team gathered in the South Quad Dining Hall for a final group photo. 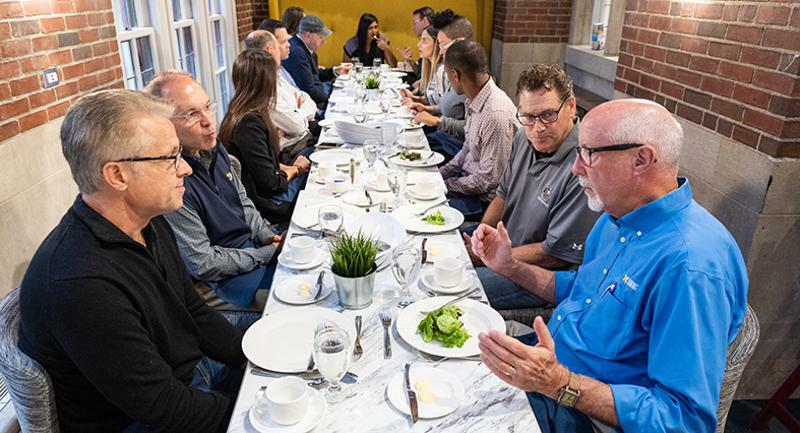 They chef attendees represent every segment of noncommercial foodservice—K-12, College & University, Business & Industry, Health Care and Senior Living.